from earthly toil and sorrow. May you find peace in rest today! I recently saw a live video of a blogger making cake pops, they looked delicious and fun to make! I have made cake pops in the past by baking a box cake mix, crumbling it and adding a can of frosting then when set dipping in chocolate. I have also done crushed Oreos with cream cheese, super simple. The video was red velvet with cream cheese frosting. 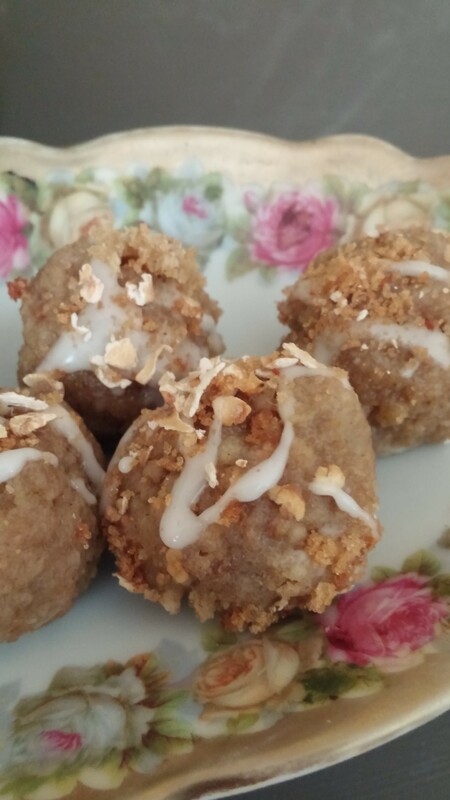 But it got me to thinking what about a Coffee/Crumb cake cake pop, sounded good to me! I set out to find a good crumb cake recipe but then thought I wanted to try to make it Gluten Free. I started with a Food Network recipe but ended up re working the whole thing! It turned into a fairly healthy recipe! 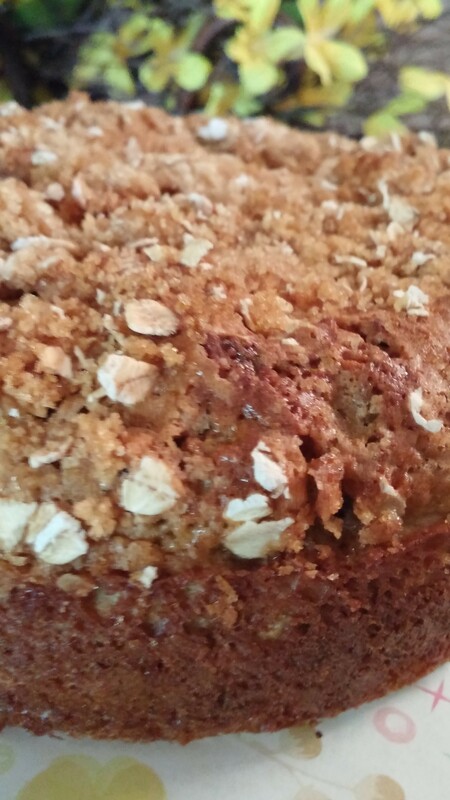 I was extremely pleased with my new crumb cake creation from my kitchen!! 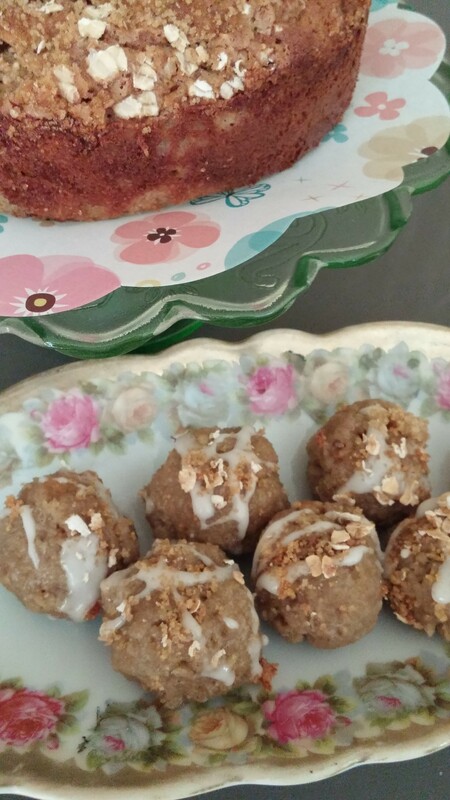 I made the recipe into 2 small cakes so I could have the cake and then have a smaller cake to make into cake pops. 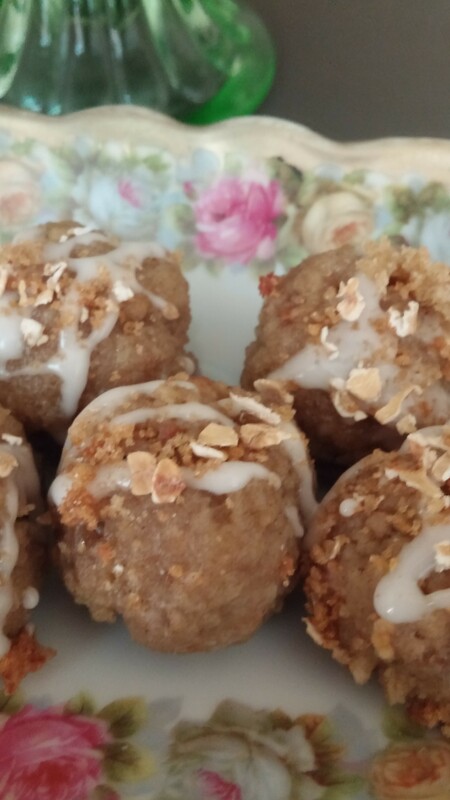 I am sharing both recipes with you today. For the cake pops I made a spiced buttercream to use as the binder for the cake pops. ENJOY! 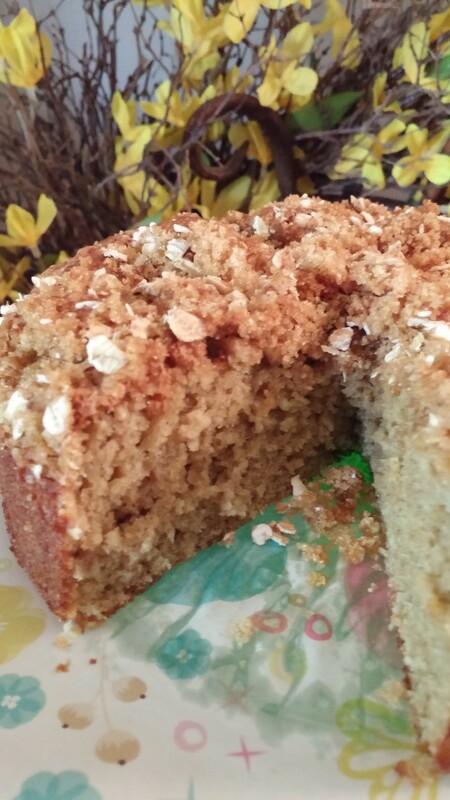 Crumb Cake by Debbi K.
Whisk the eggs with the sugar. Stir in applesauce and vanilla. Mix in gently the flour, oats, baking powder and salt. Pour into 2 small baking pans. Top with crumble and bake 375 degrees for 20 to 25 minutes. I used 1 6 inch cake pan and one 5 inch cake pan. 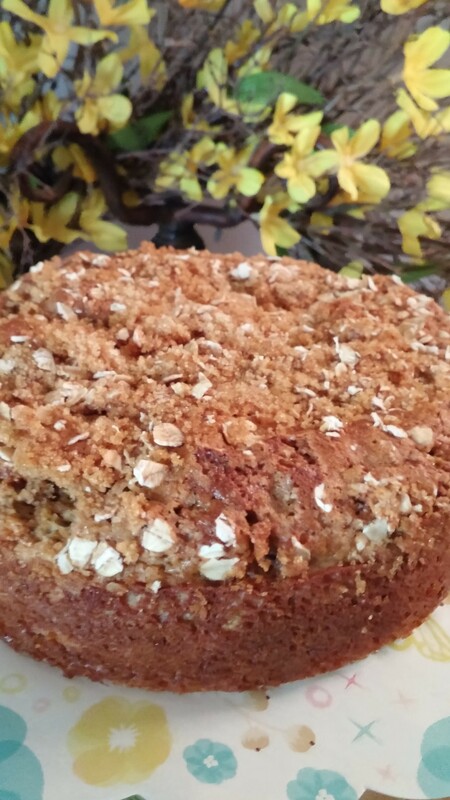 This cake is the perfect breakfast treat with a cup of tea or coffee, so delicious!! Combine and place on top of batter before baking. For cake pops: use your 5 inch cake and crumble cake into a bowl. 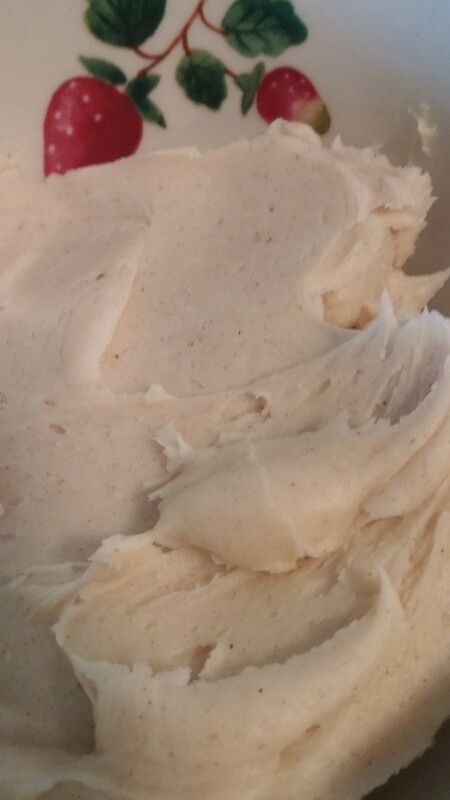 Add in your buttercream, start with half of the buttercream, when you can easily form into balls you no longer need more buttercream, I used a little more than half. Freeze 10 mins. Drizzle with powdered sugar glaze and sprinkle lightly with crumbs from the cake. When you remove your cake from the pan some crumbs will fall off, use these to top the glaze with! I couldn’t find my cake pop sticks, I actually prefer them without the stick. If you want sticks, you can find them online usually at Etsy.